OTTAWA, Ontario – October 19, 2017 – From Beethoven to Beyoncé and from the Allman Brothers to ZZ Top, your music sounds better with higher highs, lower lows, and less harmonic distortion. From heavy-duty industrial cutting lasers to delicate, precise medical lasers, the result is better with fast turn-on, fast turn-off, and short duration power pulses. DC-DC converters for Data Center and high-density wireless chargers require exceptional switching performance in their power stages. The key electrical components that make this all happen are ultrafast power transistors and speedy transistor drivers to deliver precise, megahertz pulses of energy to the intended loads. 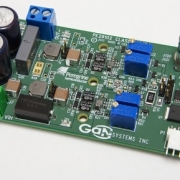 The GS61004B GaN E-HEMTs used in conjunction with the PE29102 high-speed GaN E-HEMT Driver, generate low dead times to minimize crossover distortion in class-D applications. The PE29102’s unique set of phase-control pins enable the same part to be used for both phases in bridge-tied load (BTL) configurations—a technique used in audio amplifiers. The GS61004B-EVBCD evaluation platform is available worldwide through distribution channels. 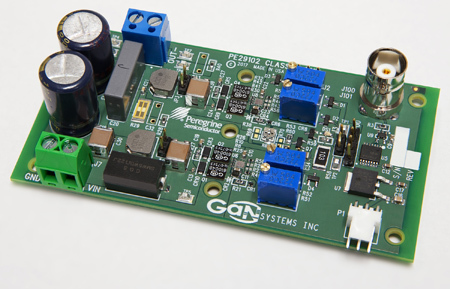 The evaluation platform includes a GaN E-HEMT Driver GS61004B Full-Bridge evaluation board assembly and detailed User’s Guide. The GS61004B-EVBCD is priced at $99 ea.